Succar is the generic name for sweet, soluble carbohydrates, mony o which are uised in fuid. Thare are various types o succar derived frae different soorces. Semple succars are cried monosaccharides an include glucose (an aa kent as dextrose), fructose, an galactose. 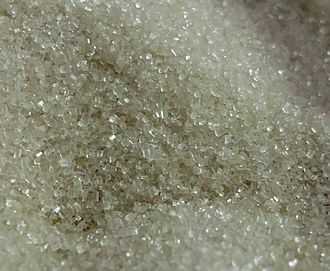 The "table succar" or "granulatit succar" maist customarily uised as fuid is sucrose, a disaccharide o glucose an fructose. Succar is uised in prepared fuids (e.g., cookies an cakes) an it is addit tae some fuids an beverages (e.g., coffee an tea). In the bouk, sucrose is hydrolysed intae the semple succars fructose an glucose. Ither disaccharides include maltose frae mautit grain, an lactose frae milk. Langer cheens o succars are cried oligosaccharides or polysaccharides. Some ither chemical substances, sic as glycerol mey an aa hae a sweet taste, but are nae clessifee'd as succars. Diet fuid substitutes for succar, include aspartame an sucralose, a chlorinated derivative o sucrose. Succars are foond in the tissues o maist plants an are present in succarcane an succar beet in sufficient concentrations for efficient commercial extraction. The warld production o succar in 2011 wis aboot 168 million tonnes. The average person consumes aboot 24 kilograms (53 lb) o succar each year (33.1 kg in developit kintras), equivalent tae ower 260 fuid calories per person, per day. Syne the latter pairt o the twintiet century, it haes been questioned whether a diet heich in succars, especially refined succars, is guid for human heal. Ower-consumption o succar haes been implicated in the occurrence o obesity, diabetes, cardiovascular disease, dementia, an tuith decay. Numerous studies hae been undertaken tae try tae clarify the poseetion, but wi varyin results, mainly acause o the difficulty o findin populations for uise as controls that dae nae consume or are lairgely free o ony succar consumption. This page wis last eeditit on 2 August 2018, at 06:05.